The gif shows the PlayMaker window next to the graph window. 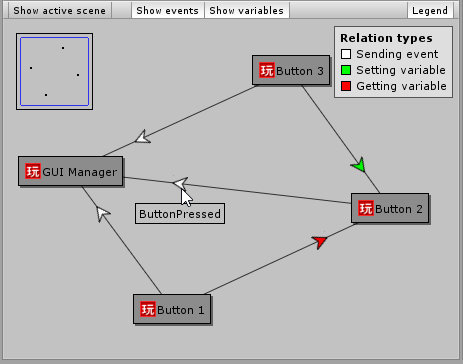 All scene FSMs are shown as nodes, the events sent between them are shown as edges. When a node is selected, PlayMaker will select that FSM. Edge markers show their event name as tool tip and allow you to open the state that sends the event as well as the transition that receives the event via context menu. As a PlayMaker novice, I'd be happy about any feedback and critique. I've tested only with the sample scenes and would like to see what the graph of a real project looks like. Install the attached package. It's the PlayMaker add-on for RelationsInspector. Select PlayMakerFsmEventBackend from the window's toolbar dropdown. Click the show active scene button in the toolbar. That will open the graph. That looks damn cool and handy! Something I was missing, a simple way to see how all the FSMs work together! - does not show events send to "FSM component"
- does not show events send by "send event by name"
- do you think it would be possible to illustrate shared variables, too (f.e get fsm float, set fsm float)? - do you plan to sale a RI playmaker version or is RI Pro the only option? - what about "call method" and "send message"? is it possible to mix backends, it would be handy to see the fsm events and the messages to or from other scripts as well? Aren't public events the only ones sent between FSMs? I'll add support for FSM component targets and send event by name actions. Should I add any other actions? The list of backends is filtered. Only the ones that match the target objects of the current graph are shown. Press Clear and all backend types will show up. Auto-refreshing the graph every x frames seems like overkill. The Rebuild button let's you do it manually. Maybe I'll make it a toolbar option. A shared variable graph is possible. Would you want it merged into the event graph or separate? I have no plans for a special PlayMaker version. All PlayMaker support will be in the form of free add-ons. Graphs for called methods and sent messages are possible too. Mixing them is a bit tricky, but I can see how that would be useful. You could used the EditorWindow OnHierarchyChange event to rebuild the graph... or make that an option. Maybe in EditorWindow OnFocus as well. I could also expose a delegate in the Playmaker editor when the FSM has been edited, so you could hook into that. That would be great. In the meantime, I'll make it optionally rebuild on scene changes. I have a problem with SendEventByName: its event name field dropdown contains variables instead of events. Am I doing something wrong? SendEvent actions work fine. Also, one useful feature would be study and represent where events are fire using the api. I am doing a lot of monobehaviours acting as proxies for firing "system" events. Like for the new UI system. In Many projects, this is playing a important role in the logic flow. I don't have a solution unfortunatly, other than declaring an attribute to use ( Like I do in PlayMaker Utils), but that means compatibility issues if that attribute is not declared within PlayMaker. Attached is the new version that adds support for SendEventByName actions and FSM Component targets. @Alex: yes that makes sense. Btw, I can't use the hierarchy-change event for rebuilding the graph. It doesn't fire when FSM actions are modified. @jeanfabre: I don't understand. Are we talking PlayMaker events or Unity events? There already is an add-on for Unity UI events. Thanks, "send event by name" (also non global ones) and "FSM component" work just fine now! Great! Visible fsm events, fsm variables and communication to or from scripts would give one a good and quick project overview! I think it would be handy to have those in one backend view, maybe different icons / colors for events, variables and messages (methods)?! Is visual debugging (like in playmaker FSMs) planned for RI? To see what's going on in runtime would be very helpful! I am talking about PlayMaker events yes. I have created multiple systems that allow developers to catch Unity events and forward them as PlayMaker events, and that happens within regular Monobehaviours. Again, I am not sure it's practical for you to start looking outside PlayMaker, but in this case (as for all the proxies for PlayMaker you find on the Ecosystem), I created a standardized way of declaring these. It's not 'official' however. I added relations for variable access between FSMs to the event backend, as you suggested. The new version is attached. Here I wrote basic documentation. That's beyond the scope right now, but could be added in a future version, provided that PlayMaker's public API allows it. @jeanfabre: That seems really useful. Right now I only want to cover PlayMaker's own features though. I'm able to see the variables set if I use "Set Fsm Variable"- they don't show up if I use "Set Fsm Float" o"Set Fsm Game Object"- it would be awesome if variables using those set/get actions showed up as well- unless they already do and there's a trick to it?